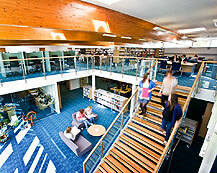 Library services at the Scottish Borders Campus and at our Newtown Campus are being provided to Borders College by Heriot-Watt University Library Service. We offer a wide range of resources to students and staff covering all college subjects, and general subjects such as careers, citizenship, study skills, core skills and much more. renew loans (before they become overdue). There are also facilities for scanning, printing and photocopying and our staff will assist you in using our project binding equipment. Staff and students with wireless enabled laptops will also be able to access the Internet and the Borders College network via our wireless Internet connection. Our friendly staff are always happy to help you find the information you require for your college work. Please just ask!